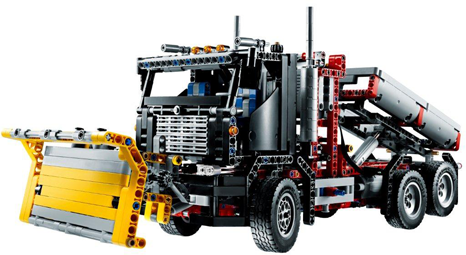 Today, on a German toy store's site, the first picture of the 9397 Logging Truck appeared. Clearly the bed can tilt via an LA, and the plough assembly looks complicated enough to suggest at least two degrees of freedom: probably raising/lowering and turning side to side. There’s also a hint of the two rear axles being longitudinally pendular, like on the 8273 Off Road Truck and the 8264 Hauler. There's a curious detail about this model: there is a red lever at the vehicle's mid-length surrounded by light grey beams: this structure is the same as in the set's A-model. The same may be said about the mudguards (excepting the detail of a blue pin) and, by extension, the general proportions of the chassis. This suggests that the A- and B-models share the same chassis and core mechanics, and only differ in the "topping" and end mechanisms. On one hand, this is a bit of a let down because the set becomes less of a "2-in-1" than a "1.5-in-1", like the 8466 4X4 Off-Roader, which similarly shares its chassis between models, and, more egregiously, the 8288 Crawler Crane, whose difference between models is just the placement of one of the booms. On the other hand, the fact that the Logging Truck's chassis has four functions all stemming from the same motor and is capable of having different bodies is a sign of modularity, which potentially makes it a good base for modifications. This is also happening with the 8110 Mercedes-Benz Unimog U400 and its front and rear mechanical and pneumatic PTO's with fans coming up with different attachments of their own. Also, considering that the A-model has four motorised functions and there are only three immediately visible functions on the B-model, either there's a fourth hidden function (the only one I imagine is a 3rd degree of freedom for the plough, but, at this scale, it looks unlikely), or the core multiplexing mechanism is underused. May be the rear axle can be up and down?, looks a little un in the pic. That's a nice looking B model. I agree with Jorge...it looks like the rear axle may be liftable. If so, this is a nice feature. • Power Functions to move the robotic arm and take one of the stabilizers and. • The gripper can be rotated to reduce you and lift. • The opening doors provide access to the cab! • Under the hood of the highly detailed engine with moving pistons to light. • Can be controlled completely and steer! • 2-in-one model: Can be converted to snow shovel into a container vehicle. • Use the Power Function to reduce the rear wheels and tilt the container! • Raise and lower the snow shovel Dump Truck! • Be moved the snow shovel by hand to the left or right. • Overturn the cab using high the Power Functions to take a look at the oil column. , the container vehicle • with snow shovel is 22 cm high, 15 cm wide and 56 inches long. This is not new. 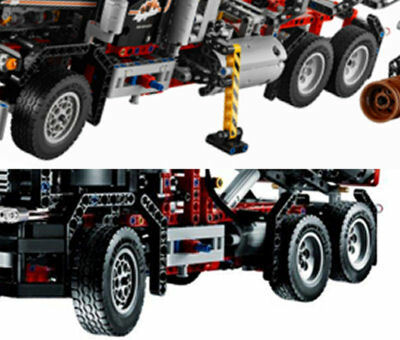 Even, mytic sets like 8421 crane or 8448 supercar, shared the same chassis for A and B models, only changing the body or the kind of accesories. Even though the liftable rear wheels are a nice function, I don't think this set has a nice look. Much better the American style of set A. As per the comment above, it looks like it is possible to "Overturn the cab using high the Power Functions" .. this would be a new function. Similar to those of 8070. I don't think the chassis of the two models will be too similar. The gearbox will probably be fairly different, for which the chassis will have to be altered; the only real reason it looks similar is that it has six wheels and the same switch. And I guess the motor is in the same place. But then, it works well enough, so why make it radically different? I think it will be sufficiently different that you can still call this a full B-model. I'm not sure the chassis is the same. It looks VERY similar, but on the B-model the distance between the switch and the rear wheels looks shorter than on the A model where it has both the gray panels as a fuel tank and the outriggers in between the switch and the wheels. Yes the rear axle is the 4th function. Road trucks can often lift their rear axle. I guess it is because they don't need it when they are without cargo and to save the tires. So this is more interesting than any pendular boggie wheels. 9397 can already be bought!! !